Nothing is more Canadian than the majestic sugar maple tree, beautiful in its autumn dress, and producer of the sweet sap which is boiled down to pure maple syrup. 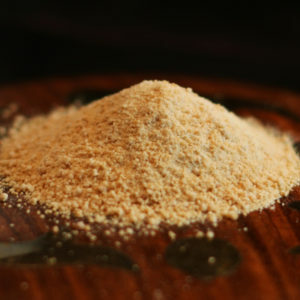 The two important species of maple in maple syrup production are the sugar or rock maple and the black maple. Maple trees need to be about 40 years old or 25 cm (10 in.) in diameter to have one spile or spigot. The sugar maple is found only on the North American continent. 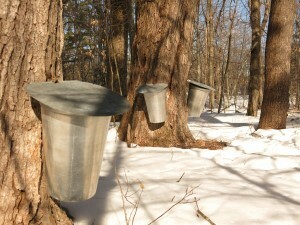 It takes approximately 40 litres of sap to make 1 litre of maple syrup. 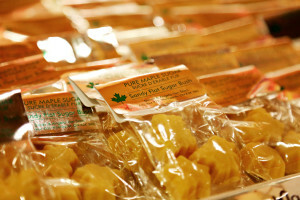 Pure maple products contain no preservatives, artificial colour or flavouring. 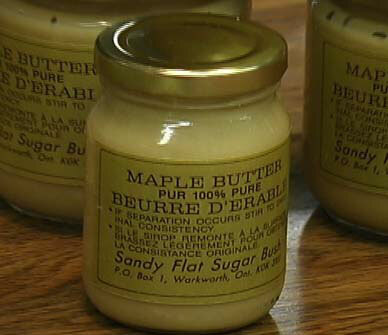 The Native people were the first to make maple syrup. It is the oldest Agricultural Industry in Canada. Fresh maple syrup is truly one of the first signs of Spring. The production of maple syrup is controlled by the weather as we need frosty nights and sunny days with a plus temperature. 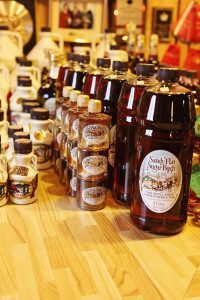 We carry light,medium, and amber maple syrup.